The Paris métro line fourteen is the newest one of the Parisian subway network. Learn how to pronounce the Paris subway station for “la ligne 14″: ” Saint Lazare – Olympiades” + the beauty and the ugliness of the Paris métro. 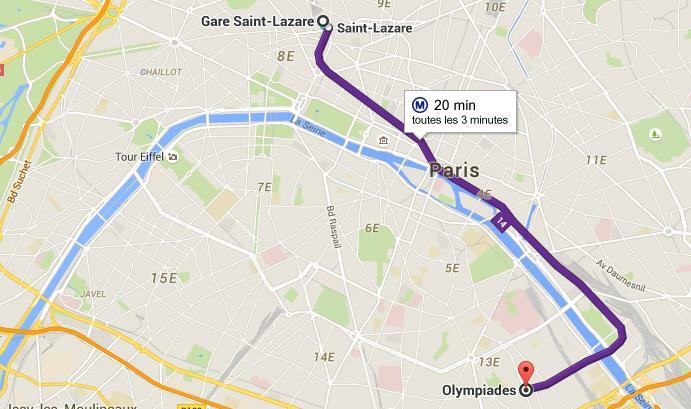 This is the newest of all Paris metro lines, and the last one so far! Inaugurated in 1998, it serves the North-west to the South-West of Paris. Originally designed to reduce traffic on line 1 and facilitate connections with the RER, it quickly became one of the busiest lines in Paris, with as early as 2010, 12 years after its inauguration, a million passengers a day! Discover a particularly modern line and, made unique in Paris, fully automated: the trains are being controlled remotely. Security is at the heart of the Paris subway line 14: windows with doors that open upon arrival of the trains avoids for example any fall on the rails. Yes, you’ve heard many stories and you’ve been warned… There are indeed many pickpockets, beggars etc… riding the Paris métro. But there are also a lot of normal, decent people. So, if you are in trouble, say so! You will witness act of candor for your fellow passengers: helping someone with a stroller down the stairs, giving up their seat for an older person… You do need to be aware of what could possibly go wrong, and you will see sad things such as homeless people catching a bit of a sleep in a station during the cold winter… You’ll smell pee and may catch glimpse of a rat or tow (look on the rails…). But you should also admire the beauty of some métro stations, enjoy the talent of some incredible musicians, and see the kind gestures happening discreetly all around you.